If I read it one more time I’m going to hurl. Now what would that be? 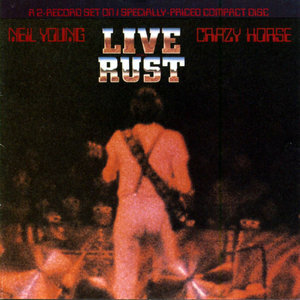 Well that would be that Live Rust was recorded on Neil Young and Crazy Horse’s tour supporting Rust Never Sleeps. No, No a million times no! Most of Live Rust was recorded at the Cow Palace in San Francisco on October 22, 1978. Rust Never Sleeps was released, June, July 1979. Live Rust was released on Nov., 1979. How wrong is the statement that Live Rust was recorded to support Rust Never Sleeps? Well, some of Rust Never Sleeps was recorded during the Live Rust tour. Live Rust was actually recorded during the Comes a Time tour. That and I guess you could also say that Neil was also promoting his triple greatest hits album, Decade, which also was still somewhat current. I was lucky enough to see this show live at the Chicago Stadium. I remember so much of it, as if it were yesterday. There are a few visuals that stand out, the first being the very beginning of the concert. All the amplifiers and stage equipment were covered by huge wooden-looking crates. Beneath the ‘crates’ were over sized amps. One ‘crate’ started to ascend and there was Neil, sitting beneath it playing his acoustic to “Sugar Mountain.” Yup, just like it was yesterday. The acoustic was played first, as the song continued, you became very familiar with the lead riff. “Ok, cool song” you thought. 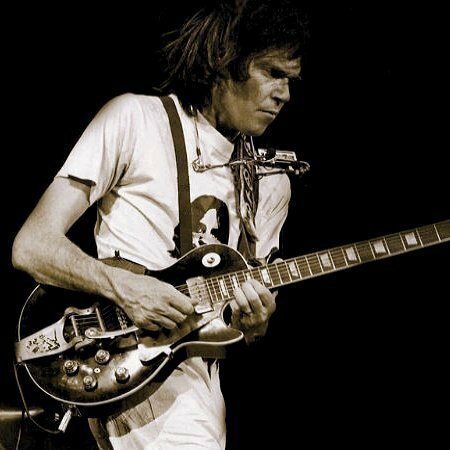 About an hour and a half passes, now Neil along with Crazy Horse are all plugged in. They kick into the electric version, remember, neither of these songs had been released yet, and you start hearing that familiar riff only louder. You say to yourself, Oh, I like this song, but I can’t place it, were have I heard it before? Well, duh, quit thinking back thru the Neil catalog, you just heard it for the first time earlier in the evening! Ah, that’s it! What a great way to introduce a couple songs. Remember that the next time a band you are checking out and the front man says, “this is a new song” and you think it’s time to hit the can. You just might be missing something historic. I have an old Led Zeppelin video. In it, they say here’s a new song and start playing “Stairway to Heaven.” People think it’s some ballad and you can see them hitting the aisles. Do you think they wish they’d stayed in their seats? Oops. Closer to home, give a listen to “Old Man” on Neil’s Live From Massey Hall album. It’s was a new song for those people. It get zero reaction at the beginning. Yeah, that would have been fun to hear even if you didn’t know the track. 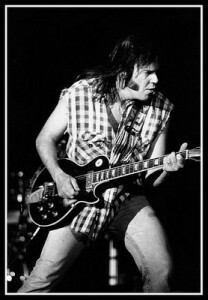 Live Rust is a great way to hear a nice retrospective of the early to middle sections of Neil’s career. You get some Buffalo Springfield, (“I Am a Child,” ” Mr. Soul”) and then the full gamut of solo goodies. You do not however, get any Crosby, Stills Nash and Young. Crazy Horse joined Neil for the rest of the album. You’ll have to look long and hard to find a better backing band. They laid down such a perfect groove. Side Three with “Powderfinger,” “Cortez the Killer” and “Cinnamon Girl” is the perfect example of this. All tracks written by Neil Young, unless noted.